Perry Block - Nouveau Old, Formerly Cute: Beware, the Baby Blob! "When the Blob was destroyed six months ago right outside my home," said Stefan McKing, the noted monster hunter, "a little piece of it escaped, never yet to be found." "Oh, no!" I said. "I thought that horrible creature was destroyed once and for all." "I've searched, Lord knows I've searched," McKing told me. "I've combed through the entire house and grounds countless times!" "You know, McKing," I said, "if I were you, I'd burn down the place. I'd knock over that candle on the hall table and let it all go up in flames!" "No, I'd never get rid of that candle," said McKing. 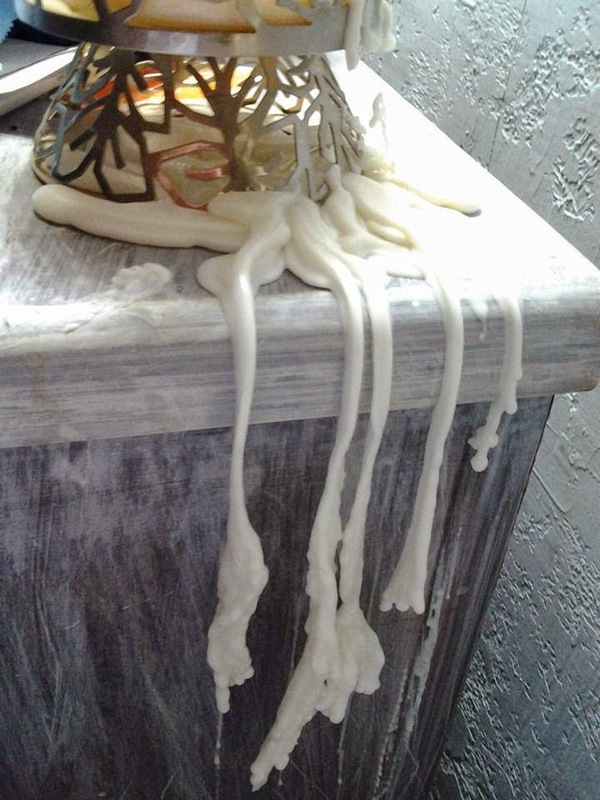 "I love the cool design the melted wax makes." I don't know how many sequels to The Blob this makes, but I'm happy to present my own personal sequel as this week's contribution to the Friday Fictioneers based on the picture prompt above, especially in this time of endless reboots of science fiction, horror, and monster movies. I understand that a Star Wars sequel is soon in the offing as well, and that the three stars of the original cast will all appear. This should be really cool, although I'll miss having Mark Hamill mowing my lawn for the couple of weeks he'll be gone. In any event, don't you miss the contributions of the other Fictioneers to this week's prompt, which are not a long time ago in a galaxy far far away, but clickable right here. Yes, and a host of books and movies to his credit. At least Stefan McKing was featured in a 120 word story by me. It's almost even. Thanks,Carrie! Stefan McKing...any relation to Steve McQueen? Good story!!! That's a bingo! I realized that people might also think it's a reference to Stephen King, but yes, I was thinking of the late "they don't come cooler than him" star of the original Blob, Steve McQueen. Sorry, no prize for that, Jan! :) :) Sometimes things are right under your nose. BTW, I know someone in your area who could mow your lawn while Hamill is out. Better be careful, it looks like that baby Blob is creeping around... Lovely idea for a story. Not very savvy, that McKing guy. Hehehe, nice! :) Your stories make me smile. I guess these guys don't have very big noses. That's great, as long as he or she is another washed up film star. I have standards, you know. Yes, and I don't think there's gonna be much waning from now on. I think Stefan may be lucky to have an eye left in a little while. Good thing he's enjoying the aesthetics now. Then again, it could just be wax. But I wouldn't bet on it. Well, he's a noted monster hunter, but we didn't say what he's noted for! Thank you. They make we wince, but I'll accept the compliment. I thought I found baby Blog, but it turned out to be just some loose ear wax that passing through on its way to a convention in Kansas City. We had a couple of beers then he started talking about your ear hair and got sick and threw up. My ear hair got sick and threw up over you and your ear wax too. Several hundred of my ear hairs even died! Stefan McKing just loves pretty candles. Oh, and he's nuts too! Thanks, Alicia. I'm starting to recognize the picture of you above. O.K., Mr. Funny Man. When I figure out how to get my profile into the Reply As box you'll see me as I truly am. Thanks for making me laugh. I like Baby Blob - maybe they should give him a chance, he might me nothing like his father. Baby Blob? Aaaaaack! Stefan McKing can keep is wicked candle and may he never have a day's luck with it. Funny story. I assume the movie version of this will be called Son of the Blob. This is the kind of stuff that a great B-movie is made of. Have your people call my people. We'll get this straight to DVD as soon as possible. Or we would if either of us actually had people.